We’re looking forward to seeing lots of you at our Sports Day tomorrow! We will be starting our events at 9.30am. After 9.00am, access to the Junior School will be through the gate on Upper Chestnut Drive only (the playground gate will be locked for safeguarding reasons). Please ensure your child comes to school in their PE kit (with colour team t-shirt). They will need to bring their uniform to change into for the afternoon. Classroom toilets will be for the use of Junior School pupils only. Adults and small children will be able to use toilets via reception. There will be a limited number of chairs provided – so please feel free to bring your own. 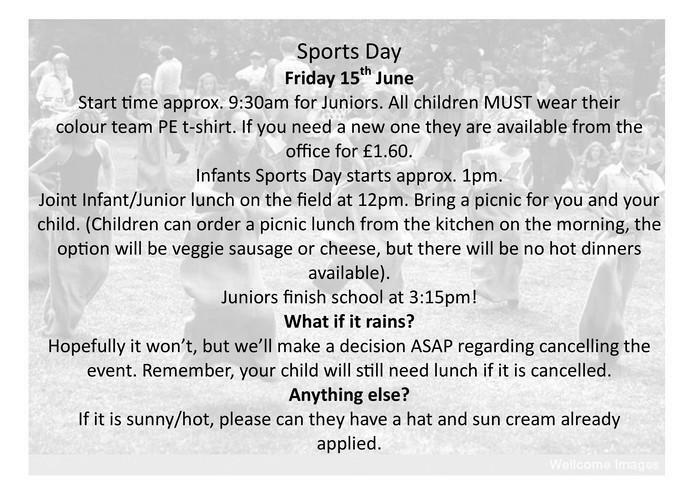 Our recent flyer on Sports Day is below and provides additional information.